The Bucks came into this season with a certain swagger, a pinache that comes with a brash, electric young point guard who had won in his rookie year, with the return of an All-NBA center, with new additions to an improving, young core, and with high expectations. They expected to power teams out of the gym. It hasn’t happened very often, partly because the swagger still hadn’t been earned, the All-NBA center was playing with a dead right arm, and there was a game or two, or three or more, despite the mounting losses, in which the Bucks seemed to be taking their “lesser opponents” lightly. In the heat of a race for the last, ignoble playoff spot in the Eastern Conference, the Bucks on Wednesday night did it again in a dreadful, uninspired and unanticipated 97-90 loss at home to the Sacramento Kings. 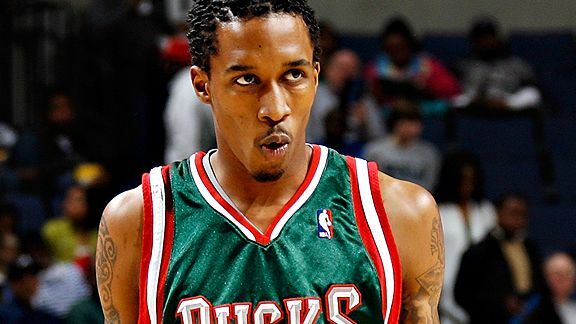 After the game, the electrifying, brash, poor-shooting young point guard, Brandon Jennings, looked at the upcoming weekend against the Knicks in New York on Friday and the Bulls in Milwaukee on Saturday, and assured that there would be no energy shortage. “I think when we play teams that are higher than us, we show up better. Playing against a team like Sacramento is kind of difficult because they have nothing to lose. Those are games you’ve got to come in there mentally tough. When you know you’re playing against the Knicks and Chicago Bulls, you kind of get up for those games.” — LINK HERE to Milwaukee Journal Sentinel story. The Bucks are 28-42 and three games behind the Pacers, two on the loss side. Yet, as crazy as it sounds, they really don’t take many of their opponents as seriously as they should. The Knicks don’t have to win, and maybe that’s part of the reason why they’ve struggled since the last time they played the Bucks in New York — Carmelo Anthony and Chauncey Billups‘ Feb. 23 debut, a hard fought 114-108 victory for the new Knicks. Fifth, sixth, seventh, eighth in the East — what’s the difference to the Knicks? They’ve proven no match for the Bulls, Celtics, Heat or Magic, locks for the top four spots. Carmelo apparently realizes this, and wants his teammates to “relax and have fun” during this time of transition. Making the new chemistry even more challenging for the Knicks — their brutal 18-game March schedule is taking its toll. “Fatigue,” not “fun” was the word of the day after the Knicks lost to Orlando in NY Wednesday. The Bucks have to win, but still don’t feel an urgency to play well against teams like the Sacramento Kings. It adds an interesting dichotomy to tonight’s Bucks-Knicks game in New York, the fourth and final meeting between the two teams this season. The Bucks won two of the first three games. In the Feb. 23 game, Knicks fans were treated to a gutsy, Chauncey Billups classic, as the veteran point guard did all the little things that Jennings didn’t, ran a clinic on how to close quarters, hit his usual quota of clutch shots and controlled the game. Carmelo shot … and shot … and shot … 25 times, making just 10 as the Bucks, led by John Salmons (27 pts) on a rare good shooting night this season, nearly spoiled ‘Melo’s big debut … until Billups (and hot-shooting Toney Douglas) saved the day. Since that game, the Bucks have been the better team, winning 6 of 13 while the Knicks record is 6-10 and they are losers of four straight. Included in those ten losses are two to the Pacers March 13 and 15 that gave Indiana life in their quest for the playoffs. It seems that Carmelo’s struggles to mesh with his new teammates and the ball-wheeling Mike D’Antoni system in New York are inexorably linked to the Bucks playoffs hopes. It should also be noted that Carmelo’s last game as a Nugget was played in Milwaukee, a nationally televised slugfest Feb. 16 that ended with the Nuggets on top, 94-87. The Bucks beat the Knicks in Milwaukee Sunday, 110-95, with Carlos Delfino shooting the lights out (30 pts, 8-11 on threes) and Salmons turning in his second straight efficient scoring night (22 pts). Indeed, the Bucks are part of New York’s woes of late, just as the Knicks troubles have hurt the Bucks playoff chances. And, yes, the Bucks need to win tonight’s rematch in New York much more than the Knicks do. Michael Redd is not expected to play in New York. He at first said he wanted to play “Friday or Saturday” but before the Kings game coach Scott Skiles said the soonest Redd would be active was Saturday. Of course, Skiles said the same thing about big forward Drew Gooden, who was activated before the Kings game but was left sitting on the bench. This entry was posted in Bucks Weekend, NBA Playoffs, The Jinx and tagged Amare Stoudemire, Andrew Bogut, Brandon Jennings, Carlos Delfino, Carmelo Anthony, Chauncey Billups, Chicago Bulls, Indiana Pacers, John Salmons, New York Knicks, Sacramento Kings, Scott Skiles, Toney Douglas on March 25, 2011 by J.D. Mo.